"It's not just about the music, it's about relationships." 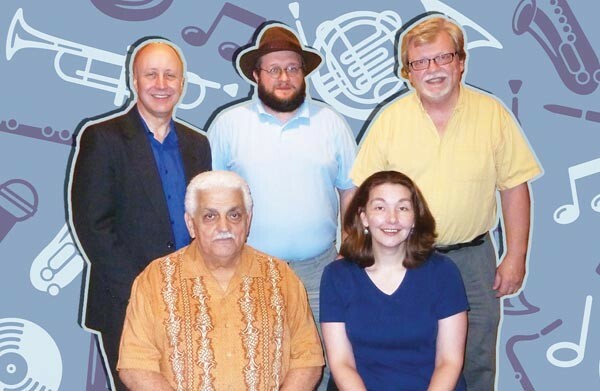 Some former WDUQ staffers — (front) Tony Mowod, Bee Barnett and (back from left) Scott Hanley, John Lasanich and Chuck Leavens — have found early success with their online Pittsburgh Jazz Channel. When Essential Public Media announced in January 2011 that it had purchased the former WDUQ, many observers had the same initial reaction: Will they still program jazz? Unfortunately for the station's jazz-centric employees, that answer — except for a few hours on Saturday nights — would be no. For a staff that had been together for years, that realization was tough to take, and not just because they were losing a paycheck. "I was just hit with this overwhelming feeling that I didn't want to stop doing what I was doing," says Chuck Leavens, the former chief engineer of WDUQ. "Working at WDUQ wasn't just a job for us. We believed in everything we were doing and we didn't see any reason to end the relationships that we'd built with each other and the people who had been listening to and enjoying the music for years. "We just weren't sure how we would continue it." Leavens and other employees had attempted to buy WDUQ from Duquesne University and actually made a higher offer for the station than EPM had. But the school opted to sell the station to EPM, which then decided to change the format to focus on news and information. That meant longtime employees like Leavens were without a job and, more importantly to them, a place to continue the city's local jazz traditions. So he banded with other former WDUQ employees to form nonprofit Internet radio station The Pittsburgh Jazz Channel to help restore the programming that was lost in the past year. "The end of DUQ was a painful time for all of us," says Leavens. "We were a work family, I'd been there for 22 years. To walk away from that was painful. "But there is such a deeply ingrained community around jazz in this city that we weren't so quick to say goodbye to the programming," says Leavens. "It's not just about the music, it's about relationships." Relationships have certainly been the key to the enterprise in the first eight months of the online station's existence. Leavens isn't the only former WDUQ staffer involved with the new project. In addition to Leavens — who also serves as the station's president — the on-air talent consists of Pittsburgh jazz broadcasting legend Tony Mowod and longtime on-air host John Lasanich. Bee Barnett, formerly of DUQ's membership-development arm, is in charge of marketing and communications. Former DUQ general manager Scott Hanley does consulting work and Dave Becker, who actually left the station in 2000 and currently works in Las Vegas, is the program director. "It's just too much fun to give up," says Becker on a conference call from Las Vegas. "I plan on keeping my hand in the Pittsburgh jazz scene until someone locks me out. "When you talk about Pittsburgh as a jazz city, it's a light heavyweight in terms of size. But when you talk about it in terms of the cultural legacy, it's Joe Louis. Pittsburgh is too important in the history of jazz not to have this kind of programming." The online component is just part of the channel's offerings. The Pittsburgh Jazz Channel is part of the PubMusic Radio Network, which Leavens says is the nonprofit parent company of the jazz station. In addition to the online jazz channel, PubMusic provides specialty jazz programming to more than 25 radio stations. "The music model and the sound we have created is something other stations have asked about. They want to bottle it," Leavens says. "As it turns out it's just easier for us to provide the service." In the first eight months of operations, Leavens says business is already strong with "income already exceeding expenses." In terms of listeners, when the station started in July, Leavens says the stream had about 100 unique visitors the first week. That number is now more than 5,100 unique listeners every month, and they average five hours and 46 minutes of listening time each. "People are responding well to what we're doing, and they're seeking us out, and we're so deeply appreciative of that," says Leavens. All involved agree that switching from an on-air FM location to the Internet is not without its challenges. Some of WDUQ's former listeners might not have access to high-speed Internet or even a computer. There's also competition from Essential, which programs jazz music on Saturday evenings, offers its own streaming jazz channel and syndicates its JazzWorks programming. But the early success of The Pittsburgh Jazz Channel, Leavens and others say, shows that people miss the old DUQ programming and are doing what they can to seek it out. "When you get down to it, the technology — whether it's the radio or the Internet — really doesn't matter," says Hanley. "You can listen to the music in a variety of ways. What's behind the music — the relationships [the listener] formed— is what they missed when this programming went away. "They miss hearing guys like Tony. That's what was lost and what this station has restored." For the time being, the plan is to stay the course — provide the Pittsburgh region with the jazz programming it's come to love while growing the operation and get the programming out to more and more audiences through radio affiliates. While the present business model has been an early success, Mowod says he still gets one question more than any other: "Are you going to start a new jazz station?" Leavens says that's always a possibility, and when potential opportunities come up, they do investigate them. At the same time, they're also happy with what they've been able to accomplish in such a short period of time. "A traditional radio station would open up a lot of challenges," says Barnett. "And the fact is, what we have is already sustainable. "It's really a huge thing to be a solvent nonprofit after only eight months." The current format is also a lot of work, but worth it, the group says. "I've never been so happy to be completely exhausted," Lasanich says. "I've worked a lot in radio at country and top-40 stations, but those were just jobs to me. "I really do feel like we're doing something special here by serving Pittsburgh's jazz community."